Who? Grace Kelly as the wealthy socialite girlfriend to Jimmy Stewart’s wheelchair – bound, window – watching, Jeff. Style? Who can forget Kelly’s turn as the spoiled, glamorous Lisa? Grace is luminescent in floor – skimming evening gowns, cool green pencil skirt and silk halter top, pearls, feminine veiled hats and gloves, and equally so, in casual attire of slim denim jeans, over sized man’s shirt and loafers. Dress? 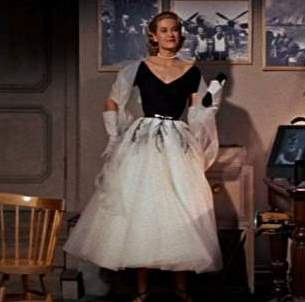 Although, legendary costume designer, Edith Head, did a pretty fabulous job overall, surely Grace’s Cinderella dress of black bodice and white tulle tutu skirt steals the show? Who? Keira Knightley is Cecelia, in the film adaptation of Ian McEwan’s tragic wartime love story. Style? It is 1935, and Cecelia glides through a beautiful, upper class home in a diaphanous, softly floral affair. In later scenes, she’s just as striking in a fashionable swimming ensemble and a suitably sombre navy blue 40s’ coat. Dress? Satin has never looked as good before or since Knightley’s iconic, emerald evening dress. Stunning, simple and sensuous, there’s no need for adornment, when your dress looks as superb as this. Who? Bette Davis undergoes a magnificent makeover as soon as she escapes from her mother’s shackles. She takes a cruise and her true self blossoms. Style? Bette’s Charlotte wears one of cinema’s most brilliant and extensive wardrobes. Neat skirt suits, oversized clutch bags, frilled blouses, floor length skirts and dresses. Hats aplenty too – veiled hair pieces, a glittering flower and tulle creation and a white wide brimmed sun hat. It’s a fashion voyage worth taking. Dress? 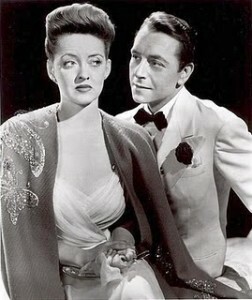 Although Bette wears a host of spectacular dresses, in one scene, aboard the cruise ship, she attends an evening do wearing a white, chiffon dress, shrouded in a twinkling cape. Capes are everywhere this season, yes, but I’ve yet to see something quite as glorious as this.